Rebuilding G.O. Shields’ “go big or don’t go” camp-ready knife selections. The Idaho Knife Works Coquina Outfit offers a large, heavy chopping knife similar to what Shields described, a sharpening steel and a very practical butcher’s skinning blade. Shields also recommended carrying a strong, multi-purpose folder like this one from Great Eastern Cutlery. 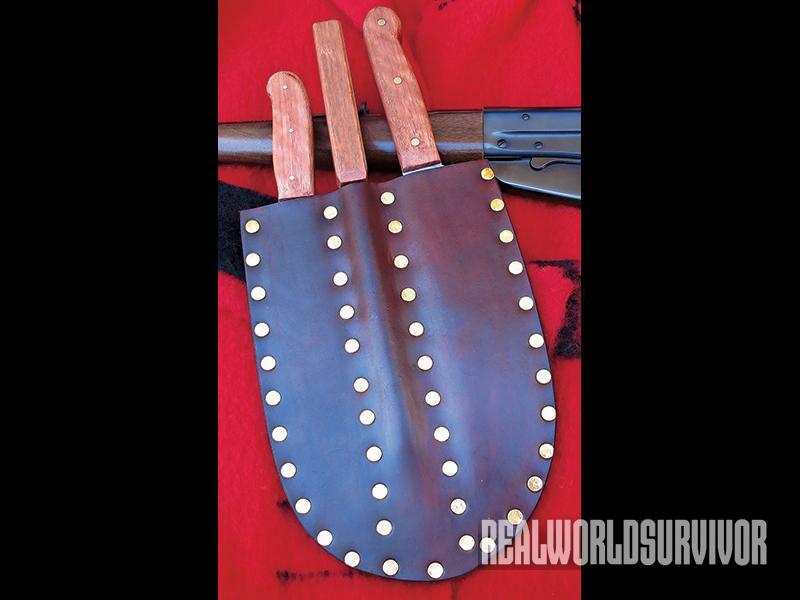 Shields’ Coquina Outfit comes in a very heavy duty leather sheath. 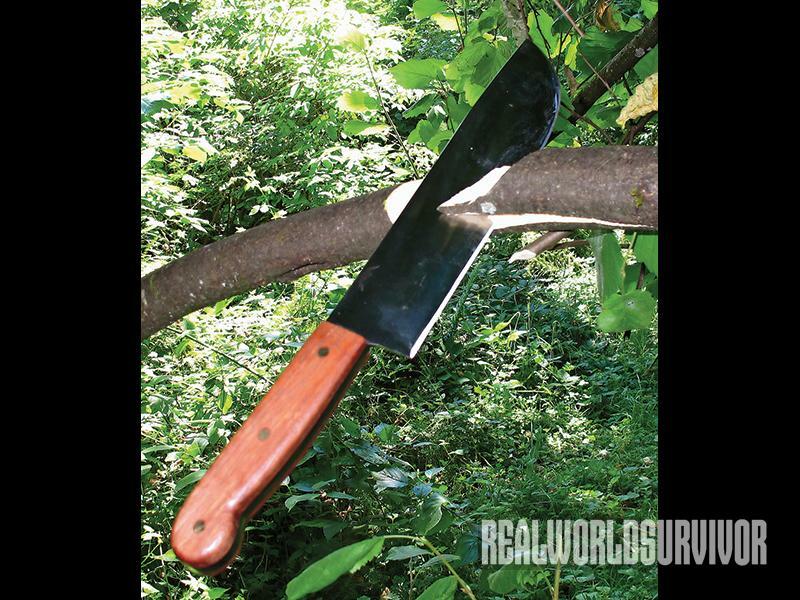 The heavy knife in the Idaho Knife Works set functions fairly well as a machete substitute. This was a low-hanging limb blocking the logging road through our timber stand. “Camp Olequa,” my field-testing area on the edge of our own timber stand. Recently, G.O. 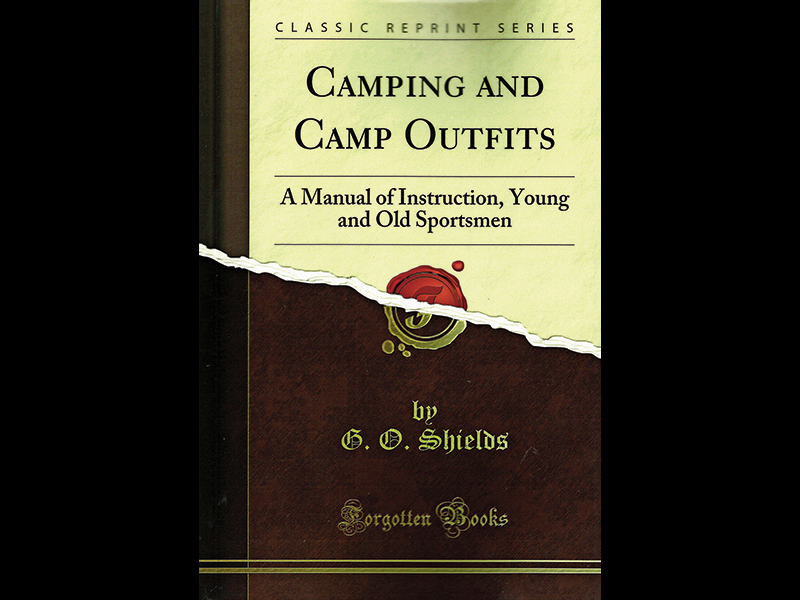 Shields’ <em>Camping and Camp Outfits</em> was reprinted. This 19th century outdoor manual takes a completely different direction than Nessmuk and Kephart. 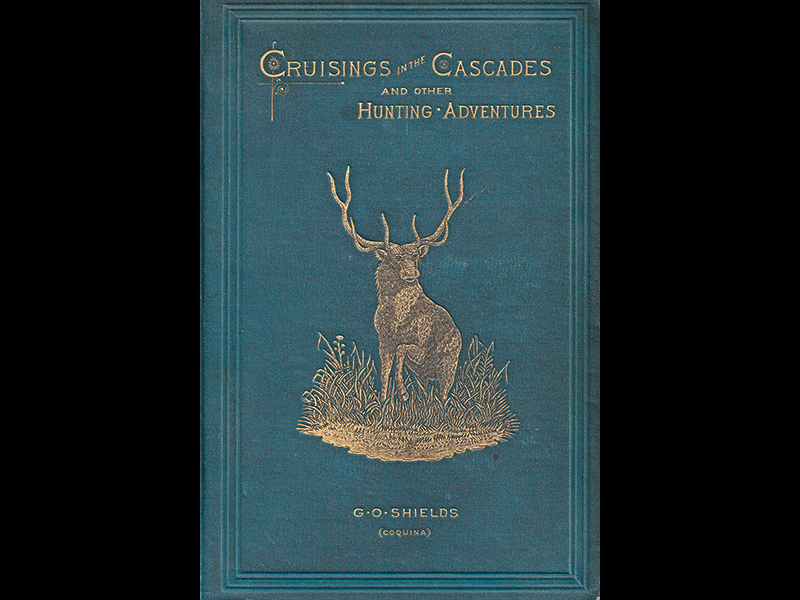 An original copy of Shields’ <em>Cruising in the Cascades</em>. 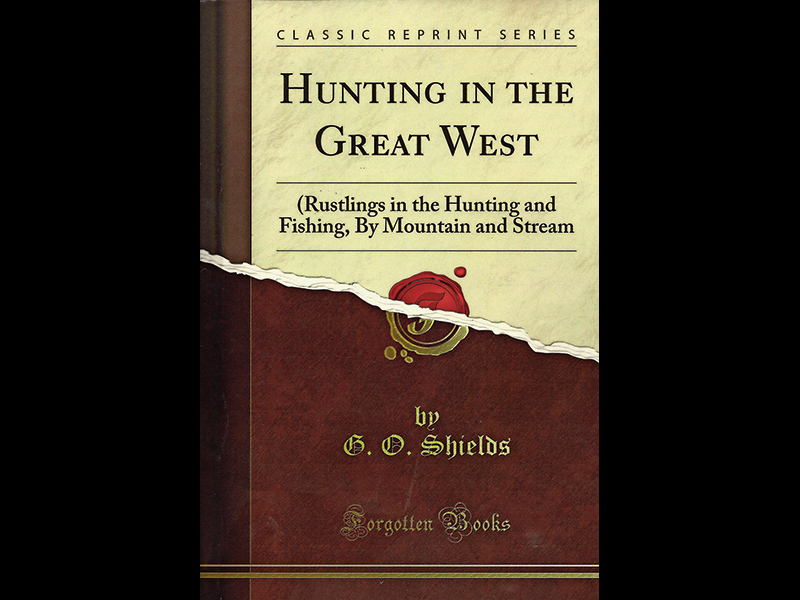 Shields hunted and explored the west when it was still wild and wooly. 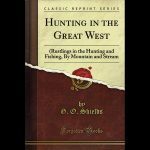 <em>Hunting in the Great West</em> is another of Shields’ stories of outdoor life in the 19th century. As most students of woodcraft already know, pioneer camping writers George W. Sears (Nessmuk) and Horace Kephart have reached something close to sainthood status with modern knife users. Their field guides made it abundantly clear they had no time for large blades or anything that resembled a “Billy the Kid Bowie Knife.” Nessmuk bequeathed to us a relatively crude drawing of a strange humpbacked skinning knife he thought worked well, but no real information on the blade. Its actual dimensions and maker remain a mystery to this day. We are luckier with the “Kephart knife,” as we know it was produced by an early Pennsylvania cutlery company called Colclesser. The 4.5-inch, spear-point blade seems to have simply been a version of a standard 19th century hunting pattern with a self-guard handle. Both writers were “Easterners.” Nessmuk penned his famous Woodcraft guide in 1884 based on his camping trips to the Adirondack area of New York State. Kephart, who published Camping and Woodcraft in 1906, was a great lover of the Smokey Mountains. 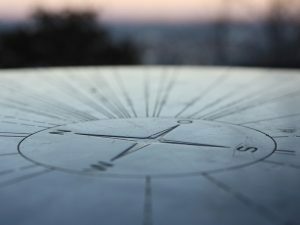 While either region may have seemed like pretty wild areas to someone fresh from the city, both locales had been explored, logged, hunted and homesteaded for a couple of hundred years by then. But then there is Coquina’s (G.O. 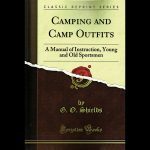 Shields) wilderness guide published in 1889 entitled Camping and Camp Outfits: A manual of instruction for young and old sportsmen. Probably few outside advanced Marble’s knife collectors have even heard of this writer today. For a very brief period around 1905, Marble’s offered a combination kit consisting of a small butcher’s skinning knife, a sharpening steel and a 5-inch “Ideal” hunting knife in a handy leather sheath as its “Coquina Outfit.” It wasn’t until the author’s Camping and Camp Outfits was recently republished that I found Shields’ own outfit actually had some major differences from Marble’s. What makes Shields much more interesting than his eastern counterparts was that he was making long, horse-mounted hunting and exploring trips over the far west when it was still the wild frontier. He hunted buffalo on the Texas plains before the herds were gone and packed through the northern Rockies while the Indian wars were still front-page news. 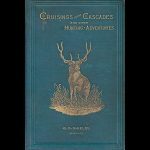 Many of his adventures became classic outdoor books, like Cruising the Cascades, Rustling in the Rockies, Hunting in the Great West and The Big Game of North America. Shields was also anything but a “go light” camper and proves that by recommending you not load your pack animals with more than 300 pounds of gear each! His massive amount of supplies was probably a reasonable necessity given how far from the nearest settlement he was much of the time. In the section on axes, he makes it plain he has no use for hatchets and recommends a full-size chopper for setting up camp. He states his large hunting knife will do anything a hatchet will and served much better for butchering large game. 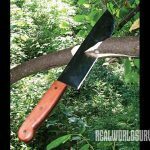 In the next chapter, he gives us a description of the original Coquina Outfit, starting with a stag-handled hunting knife with a blade “over 8-inches long and ¼-inch thick.” This was paired with a thin-bladed skinning knife and a sharpening steel. 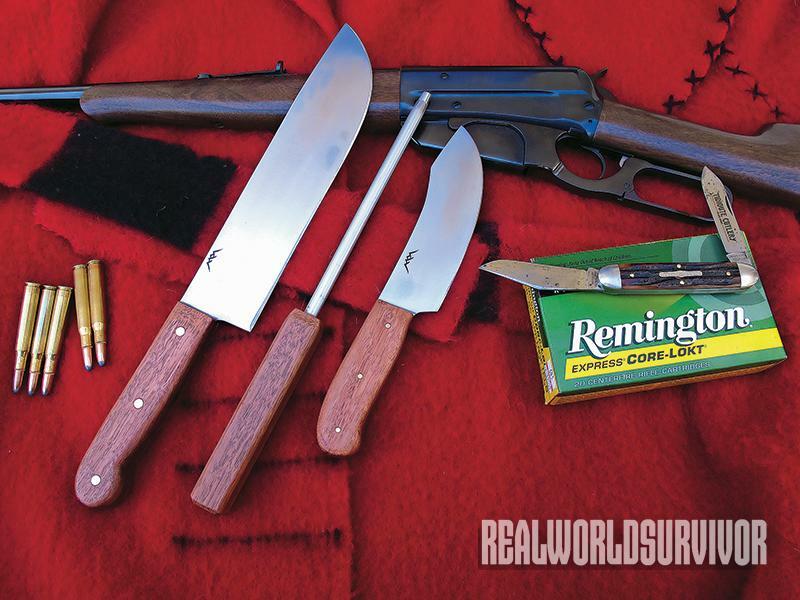 Like Nessmuk, he also recommends carrying a “good-size, strong pocket knife” and mentions it is useful for preparing big game heads for mounting. All of this started me thinking about recreating an accurate Coquina Outfit for a field evaluation. You have probably already noticed that Shields was definitely not a believer in the “a big knife is a sign of a greenhorn” message Nessmuk and Kephart preached. Unfortunately, he provides neither a drawing nor photos of his knife set, and he doesn’t mention its actual maker. Probably the first knife to come to mind for the large hunter in his kit would be some kind of “Bowie knife,” but, in my experience, the standard clip-point version is a very poor substitute for a hatchet. While I have no proof of it, I’m guessing his big blade was either a version of the Hudson Bay Camp Knife or its close cousin, the butcher’s “lamb splitter.” Either would have been available on the western frontier, and Shields also spent time hunting in British Columbia where he would have come in contact with the Hudson Bay Company trading posts. My next move was to enlist the help of custom knifemaker Mike Mann of Idaho Knife Works. Not having an original Hudson Bay to work with, I loaned him an antique “Old File” (Havana, Illinois 1906-1966) lamb splitter I own for inspiration. 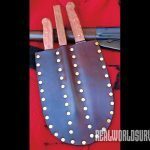 Lamb splitters basically served as a cross between a large butcher knife and a bone cleaver, so the pattern is well suited to heavy chopping chores. The skinner blade was actually to be copied off a pattern I recently found being used by Chinese butchers in Sichuan, China, with a few adjustments to better fit a larger Western hand. The end result bears a strong resemblance to the kits period buffalo hide hunters carried across the western plains. Of course, Mike’s kit is much heavier than two or three thin-bladed butcher knives and a sharpening steel would have been. 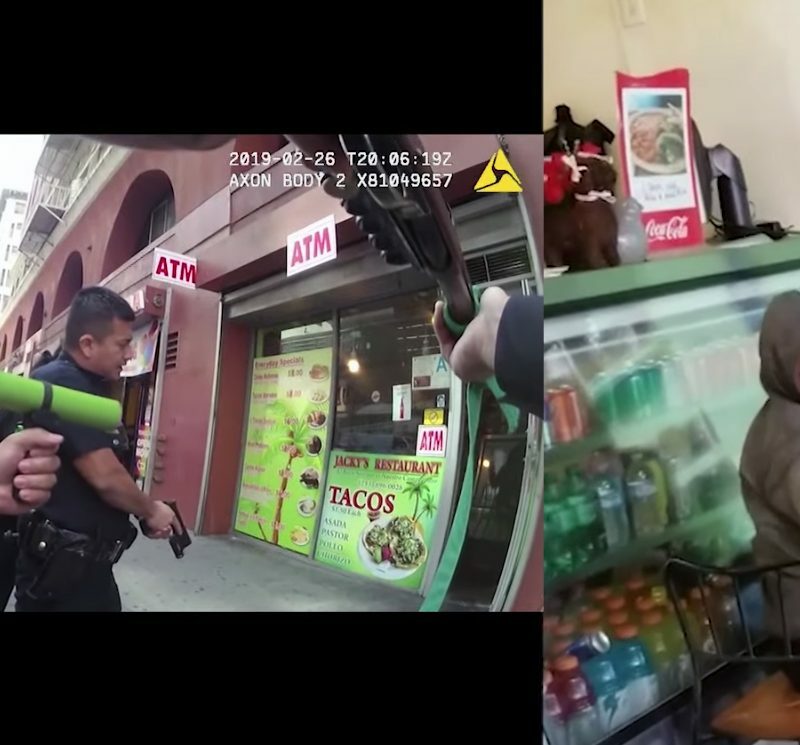 For better or worse, it tips the scales at 3.4 pounds, but given Shields’ description of his own Coquina Outfit, I doubt the original was much lighter. Mike’s heavy hunter offers a hand-forged 5160 carbon steel, 10.25-inch-long, 2.1-inch-wide blade that weighs 26 ounces out of the sheath. The skinner is 6.1 inches long, 1.5 inches wide and weighs 7 ounces. Mike tells me he would be willing to make duplicate sets for $815. Given Shields’ own comments about the larger hunter serving in the place of a hatchet, I think it is safe to assume this was much more than just a buffalo dissector to him. While I actually have a neighbor with a small herd of bison, I didn’t think I would make many friends by doing my field-testing in his pasture. Having read several of G.O.’s books, I know Shields spent a lot of time cooking over an open fire. A knife heavy enough to take the place of a hatchet would undoubtable be handy for chopping and splitting small-diameter firewood. This was obviously something that was much easier to duplicate than butchering out large animals in the field. Spring time on this homestead means cutting lots of hazel poles to length for garden stakes. By laying each sucker over a block of wood, I quickly found the large knife actually did work better than a hatchet. With our winter Northwest monsoon rains over, it was also possible to gather reasonable amounts of “dry enough to burn” kindling in our timber stand. 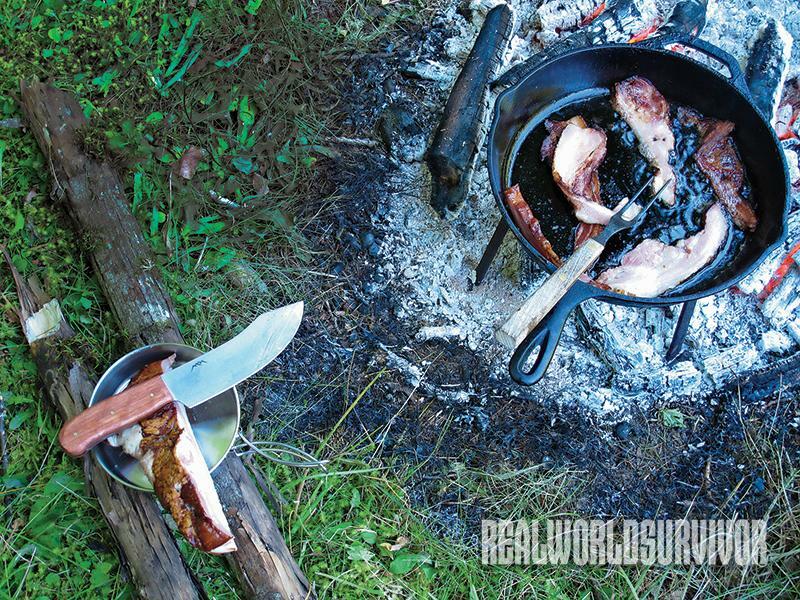 It didn’t take long to discover that a heavy knife like Mike’s does have some advantages over a hatchet around a campfire. Chopping up small-diameter sticks is a breeze, as is splitting slightly larger ones for dry kindling. When it comes to starting fires, I tend to be a wood shavings carver rather than a “fuzz stick” maker, but this knife was well suited to either task. 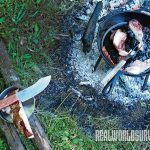 If you have read many old-time woodcraft manuals, you probably know one of the most frequently mentioned field tests for an outdoor knife was slicing bacon. With the help of good friend John Larsen, I procured a block of the old-timey variety. The curve of the skinner made it an excellent tool for the job. Shields would probably have been pleased with it. I also cut up a poultry fryer (“sage grouse” if that seems more outdoorsy to you) and processed a variety of fresh cuts for our barbeque grill during my evaluation. As expected, I found the knife made a great general-purpose butchering tool. 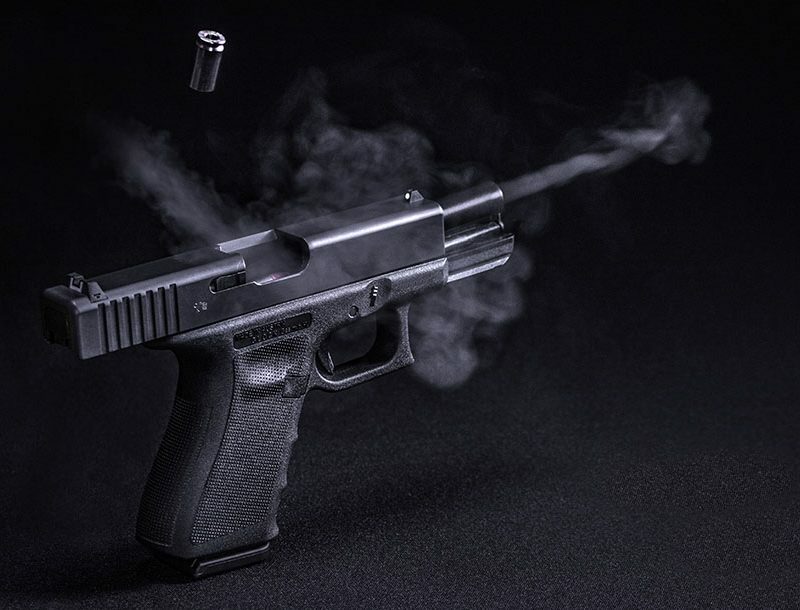 As for that “good size, strong pocket knife,” Shields would have had his choice of a number of different basic patterns. 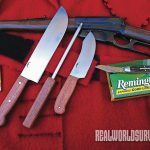 For starters, we know it wasn’t one of those nearly useless little city slicker models like the “peanut” or “congress.” Most real working knives of the period were plain two-blade jacks with wood or bone handles in either clip or spear-point styles. 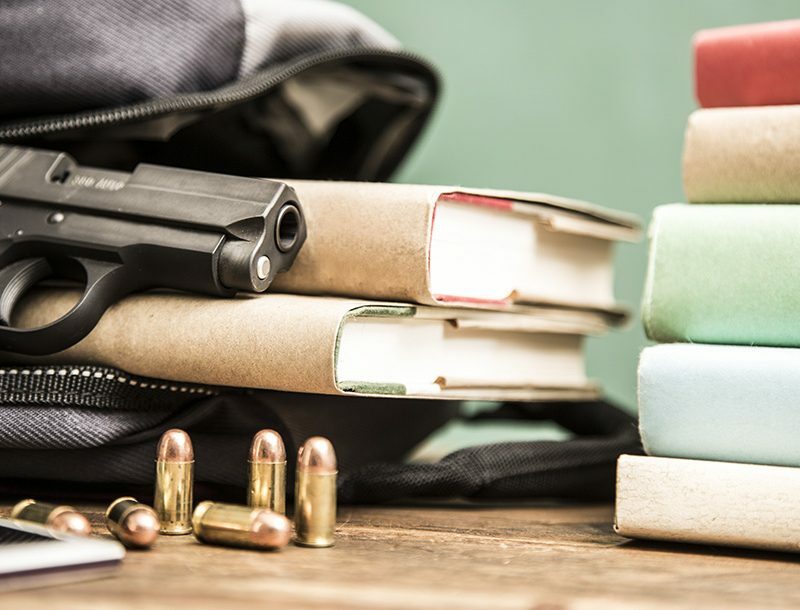 Shields quotes Nessmuk several times and I have no reason to think he wouldn’t have chosen the same two-blade, equal-end “Texas Jack” pattern folder the New England writer carried. It just so happens that one of my own favorite pocket knives is a Great Eastern 4.1-inch (closed), clip-and-spear combination, equal-end knife. This seemed like the natural knife to complete the Coquina Kit. So what function does an assembly like this have in the 21st century? I feel it is just as useful for field butchering large game as it was in the 1880s. As for weight, pickup trucks have pretty much taken the place of a string of packhorses for most hunters in the far west. Three-hundred pounds would actually be a light load for the average 4×4. I suspect Shields would have been driving one with a fully loaded bed and his knife kit mounted behind the seat if it had been option for him. So why worry about cutting ounces off your tiny little canoe if you can ride in style? For more info, call 509-994-9394 or visit idahoknifeworks.com.